Is an indirect filling that can be made of gold, porcelain or composite. Our clinic offers inlays that are made in only one visit considering that we have a dental laboratory integrated in our clinic. This means that the inlay will be ready in one visit by using the latest CEREC technology. This saves the patient’s valuable time and offers an extremely quality restoration. Dentists usually recommend the use of dental inlays for a number of reasons. The first one is when the tooth is extensively damaged. 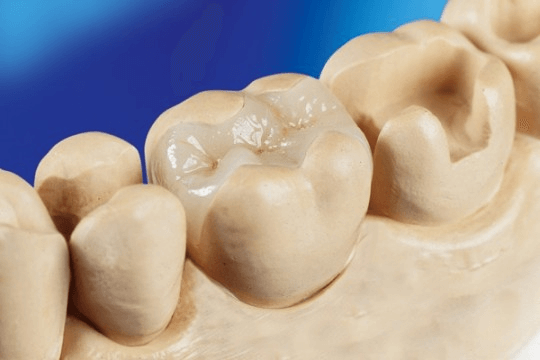 There are cases when a conventional filling simply won’t do the job. Fillings have a limited use, especially when dental decay has affected a larger portion of the tooth. Another indication is a broken, chipped and fractured tooth. Inlays are much stronger than fillings and can provide more support. Sometimes fillings cannot withhold the masticatory pressure and are not meant to cover large portions of a tooth. They need enough dental tissue to retain on. The only factor that an inlay requires is that the cusps are not affected by caries or fracture. If the loss of dental substance is so big, that the tooth won’t be able to be repaired with a crown, an inlay can be a good idea. First, the tooth is covered with an inlay, then with a crown. Dental inlays can be made from several types of materials. The most common ones include gold, composite and porcelain. Gold was used in the past, but these days, dentists prefer the newer materials. Porcelain is often the material of choice for inlays. The latest advancement in dentistry is CAD/CAM, a high-quality way to get a restoration in only one visit. The procedure is longer than a regular filling, so it requires several visits to the dentist. If the patient decides to go for the CAD/CAM method, their restoration will be done within one visit. The conventional way for inlay starts with the removal of caries and getting clean margins of the tooth. The same thing applies to injuries. Once that’s done, the dentist will take an impression of the tooth and send it to the dental lab. There, dental technicians create a mold and start making the inlay. In the meantime, the patient has a temporary inlay. Once the inlay is done, it’s taken back to the office. The dentist tries it in the mouth of the patient. There might be a need for minimal corrections. After that, he cements the inlay with special materials. Inlays are more durable and with a higher quality compared to conventional fillings. The first advantage is that an inlay is more durable compared to conventional fillings. According to studies, inlays have a longer survival rate. 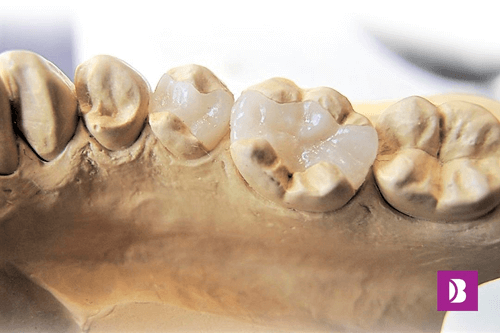 Another thing, when comparing composite fillings and inlays is the process of production. Direct composite restorations show a larger percentage of shrinking of the material. That can cause leaks, secondary caries, breaks of the filling and more. An inlay offers much more protection than a filling. The price appears as the main disadvantage for this restoration. Unfortunately, inlays are much more expensive compared to fillings. Another possible disadvantage is the second visit to the doctor, except for when the patient chooses the CAD/CAM system.